Skeleton Bay, Namibia is probably one of the starkest and harshest settings humanity has endured, and there is perhaps no coastline as remote. High winds and heavy south seas bring constant swell to the desert shores, and while it’s been thoroughly surfed, sailed and photographed over the past few decades, this bird’s eye footage taken from a drone (and maybe a GoPro attached to the kite?) show the emerald waters and golden sands in an entirely new light. Still, just looking at this place makes me thirsty. The outright world sailing speed record was shattered here in 2012 with a top velocity of 68 knots. 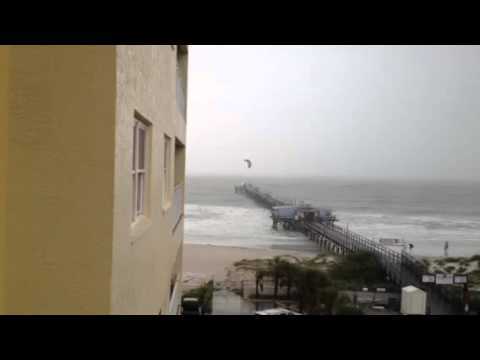 A St. Petersburg kitesurfer showed up at Redington Beach in Florida during Tropical Storm Debby to jump the pier. Clearing the pier alone wasn’t enough, however, as he effortlessly threw a flip in with the stunt. Polish kite surfer Jan Lisewski was reportedly stuck in the water for two days, surviving on energy bars and fending off 18-foot-long Red Sea sharks with a knife…The second night Lisewski said he drifted to a reef and was attacked by sharks. He said he thought they were attracted to him by the color of his kite. He counted 11 sharks in all, in a fight he said lasted the entire night. “I was stabbing them in the eyes, the nose and gills,” Lisewski told the Polish state news agency PAP. 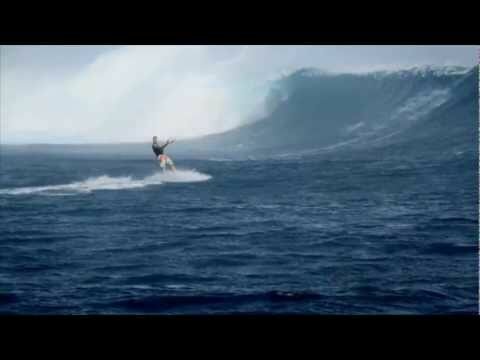 Big wave surfing has become so ubiquitous that it is almost blase. We nonchalantly watch video clips of guys flying down the face of 50 foot waves, and then turn away to sip our coffee and go about our day. It’s kind of sad that we have de-mystified such an awe-inspiring feat. Lest we forget, big wave riding is very, very dangerous. Sion Milosky drowned at Mavericks this winter, and he was a bonafide big-wave surfer. And so into this arena we introduce kitesurfing on big waves. Jean-Marc Mommessin and Frederic Stemmelin strapped on their kiting gear, and about a dozen GoPro cameras each, and charged Mavericks on a day when the waves were around 20-25 feet. 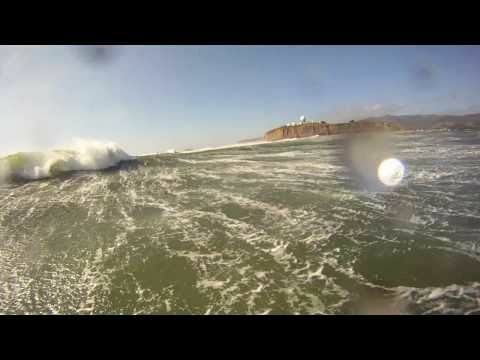 GoPro cameras are notorious for shrinking the size of waves, but you can still tell that these bombs are big. Sure, the video is a tad bit cheesy at times, but the stoke experienced from 1:56-2:10 is anything but cheesy…more like an exhilarating reminder of what these guys were out there doing. About a week ago, Alex Caizergues hit 54.x knots on a kiteboard, averaging over 500 meters in 45 knots of wind. Look at all the rocks in the area.